Enjoying a cold glass of your favorite brew isn’t the only way to experience the wide range of flavors of beer—beer can also be used as a cooking ingredient to add a distinctive flair to your favorite recipes. With its unique flavors and so many styles, beer can be the secret ingredient that makes just about any recipe taste even better. From appetizers to desserts, a splash of beer can make the difference between a recipe that tastes good and a truly memorableculinary experience. When you’re planning a meal, remember the various tastes of the thousands of different beers available in the U.S. today, and consider how the flavors of beer and food work together. Not only does beer enhance the flavor of food, but food also enhances the flavor of beer. 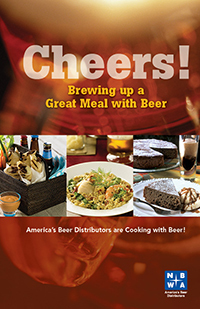 The National Beer Wholesalers Association has developed a book of recipes to highlight the array of beer available to American consumers and to demonstrate how beer enhances food. Serve these dishes with a cold glass of the beer used in the recipe, or one that compliments the flavors, to fully experience the abundant flavors cooking with beer creates. Cheers!